9.00am – This is our official meeting time at our rendezvous point, in practice most people don’t show until 9.15 and we typically don’t manage to set off much before 9.20am. For a sport where timing can play such a crucial element it’s odd that deadlines are such an elastic concept to cyclists. 9.15am – Most riders have managed to drag themselves along by this point – a time for idle banter and a bit of a catch-up. It’s also around this time that we are subjected to a ritual haranguing from Our Glorious Leader (OGL) and Road Captain – most typically about riding habits, half-wheeling, lack of mudguards, inappropriate kit, gear, equipment, tyres et al. Sniggering like a bunch of naughty school boys is incredibly immature, but almost de rigueur. Occasionally a few words of support and wisdom will be directed at any “Flippin’” New Guys who have shown up. (FNG’s – is my term, not the clubs, who welcome them all with open arms). 9.20am – Set-off; somebody usually decides we’ve wasted enough time shooting the breeze, makes a show of clipping in very deliberately and noisily and, like the good herd animals we are, we all dutifully follow. 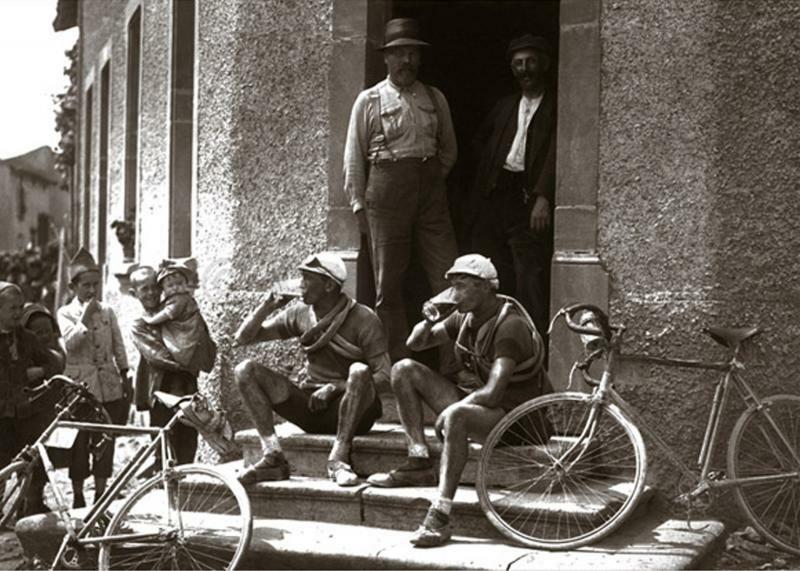 9.20am+1 – There are some riders who take great delight in rolling-through the meeting point without stopping and try to time their appearance to coincide exactly with the group setting off. I suspect that some (maybe all) of them hide out of sight around the corner where they can snigger more openly and actually avoid the ritual OGL harangue. Respect. Many clubs are more organised. They have their runs arranged in advance and listed on their website so everyone knows exactly where they are going, how far and how hard the route will be. Somewhat atypically we depend on OGL to determine the route on the day, and seemingly at whim. The other drawback is that even with the attention span of a goldfish, I often find myself wishing our routes changed more regularly – it’s like a déjà vu all over again! 11.00am or thereabouts – The first section of the run is typically spent at a fairly moderate and comfortable pace, although the occasional hill causes a degree of asthmatic wheezing and spluttering amongst the, ahem, “bigger-boned” riders. The formation is mainly two abreast, with levels of chatter in inverse proportion to speed x incline, occasionally singling out on particularly busy roads. If we haven’t had any punctures or mechanicals we tend to stop after completing 30+ miles in order to split the group. This is also an ideal opportunity for general micturition, especially important amongst some of the old fellers who need a hefty caffeine fix in the morning to kick-start the engine – and where bladder control can be an issue! We tend to split into 2or 3 smaller groups at this point, some ambling directly to a café by the shortest, least testing route, while others are lured away to their doom by the siren song of the young racing snakes, often returning to us a wild-eyed, shaking and hollowed out shells of their former self. Unless feeling particularly wimpy I can usually cope with one of the middle groups: a somewhat hillier, slightly longer, slightly harder and slightly faster ride, typically well removed from the extreme privations and self-flagellating masochism of the faster guys though. 11.30am or thereabouts – We’ve generally reached some form of café venue by this time, earning a brief respite to recover from herculean, heart-bursting, leg-burning, lung-hurting, eye-balls out efforts to hang onto back wheels, as the pace gets whipped to a frenzy before a final mad sprint to the stop. A typical, modern cycling café in the North of England, where thirsty riders can indulge in a hard earned libation. 12.00am or thereabouts – Replete on cake and coffee, it’s time to leave the sanctuary of the café and head for home. Oftentimes this is a pleasure, but at other times it’s as painful as being born, leaving the warm, dry sanctuary of the café and facing whatever a less than benevolent Mother Nature has in store for us. The shock of transition from indoors to out is sometimes enough to crack brave men and make the hardiest whimper. More than a few have admitted defeat at this point and shamefully scuttled back indoors to phone wives and girlfriends to arrange motorised transport back home. This type of behaviour is only excusable in the case of broken bones (to be proved by production of x-rays and doctors notes at the next run). General fatigue, or wimping out because it’s wet and cold is likely to earn the rider unbridled ridicule and an indelible stigmata. 01.00pm or thereabouts – We’re generally back where we started with OGL beetling off home as quickly as possible to field calls from anxious mothers wondering why their beloved (fully grown and adult) offspring were allowed to be lured away by the sect of the demon Racing Snakes, where in the wilds of Northern England they might be now and what day of the week they’re likely to return. Sad, but true.